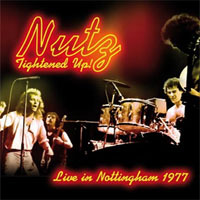 Recording for A&M, touring with Black Sabbath, wowing BBC TV's Old Grey Whistle Test...NUTZ! A showcase for their third album for A&M ('Hard'), by the time these hard-rocking faves of the UK live scene recorded this top notch set back in March 1977 for a local radio station, they had honed their act to sweet perfection. Until now unreleased in any format, it reveals the Liverpool band抯 talent for melody and theatricality in a rolling blitz of tight, showy classic rock with glints of metal shining away under the surface. Acclaimed by many musical peers of the day, including Jeff Beck, AC/DC, Ozzie Osbourne - loved by fans - Led Zeppelin抯 Peter Grant offered to manage them Yet, history reveals these boys were just too busy having a good time! But then they were Nutz! Recorded live at The Grey Topper Club, Nottingham, England, March 1, 1977 for broadcast by BBC Radio Trent.